In order to plan your outdoor lighting in such a way that it makes your landscape look its best, follow these steps: start with a concise diagram, mark their bulb wattage, and prepare for purchasing materials. When it comes to any home project, whether it be indoor lighting or outdoor lighting, updating your landscape or creating something beautiful from the ground up, planning the first and most important step. Without careful and thoughtful planning even the most beautiful of ideas can turn into expensive disasters. In order to plan your outdoor lighting in such a way that it makes your landscape look its best, follow these steps: start with a concise diagram, mark their bulb wattage, and prepare for purchasing materials, equipment and installation. It is key that you understand what size transformer will be necessary for your needs. In order to do this you must add up your entire bulb wattage and then multiply it by 1.3. In order to figure out the length of the cables your landscape will require for outdoor lighting, a similar equation will be used. Measure the total distances and then multiply by 1.3. A 12 gauge cable will suffice for most runs, but a thicker gauge should be used for longer or higher load runs. 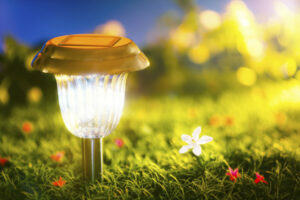 Make sure that you have outdoor lighting transformers, cable, bulbs, and path lights or spot lights. As far as the tools you will require, you will need wire cutters or strippers, a voltmeter, screwdriver, pliers, flat shovel, screws, and a drill. When you have all of the equipment and have figured out everything you need to know for safe and effective outdoor lighting installation on your landscape, assemble your fixtures and place them where they will be installed. Be sure to place your cables in strategic places and never to overload them. This can cause fires in your yard. This entry was posted on Friday, July 29th, 2016	at 9:46 pm	and is filed under Blog, Landscaping Design, Landscaping Maintenance	. You can follow any responses to this entry through the RSS 2.0	feed. Both comments and pings are currently closed.